Manufacturing Lead Time applies to this battery 7 days approx. 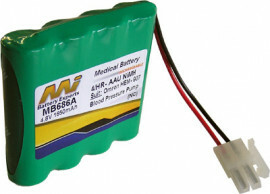 Description: Medical Battery Application: Medical Equipment Original Brand: Omron Chemistry: Nickel Metal Hydride Voltage: 4.8V Nominal Capacity: 1650mAh Brand: Master (this product is a compatible alternative to that of the original brand) Width: 15mm Height: 52mm Length/Breadth/Depth: 61mm Replacement battery suitable for Omron HEM-907 Blood Pressure Monitor. Manufactured with 4/HR-AAU Sanyo NiMH cells.